It is dentists' dream to achieve bone repair with predictability, but without donor site morbidity as well as reconstruction of injured or pathologically damaged complex dental structures, however, this will no longer be a dream as these are being made into a reality using stem cell science. Stem cell science is clearly an intriguing and promising area of science. Stem cells have been isolated from a variety of embryonic and adult tissues. Dental stem cells are multipotent mesenchymal stem cells (MSCs) brought new enthusiasm among the researchers because of their easy accessibility, high quality and they don't pose the same ethical concerns and controversy in comparison with embryonic stem cells. This review article provides brief insights about stem cell basics, the state of art in human dental stem cell research and its possible impact on future dentistry. Even though most of these modalities are still in infancy, it is evident that the 21 st century dentist is going to play a critical role in the field of medicine. The aim of this article is to bring awareness among the dentists about the huge potential associated with the use of stem cells in a clinical setting, as well as proper understanding of related problems. The immediate challenge for dentists is not only to be better able to address the questions that their patients have concerning stem cell-based therapy, but also to familiarize themselves with the spectrum of tools they may have in the near future to restore form and function of the tooth and -tooth-supporting structures effectively. 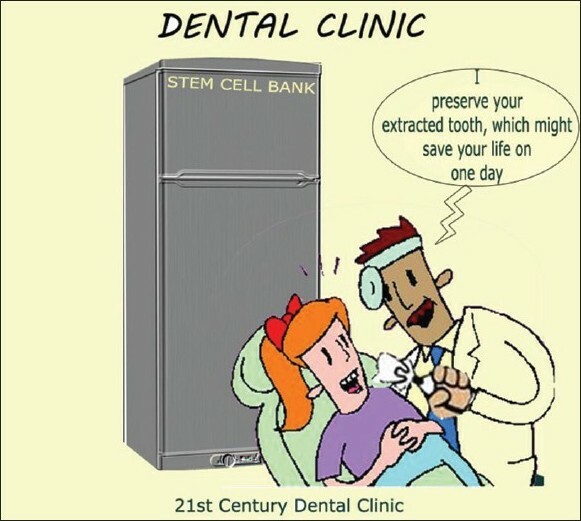 Stem cells are not science fiction, but something that one day will become a part of each dentist's clinical practice. This article reviews what one should know about the about classification of stem cells, how they differ in their biological activity - dental stem cells osteogenic potential and results of clinical pilot studies using dental stem cells for bone repair-tissue engineering using dental stem cells-future challenges, future trends, and importance of dental surgeons role. Stem cells are categorized by their potential to differentiate into other types of cells. Embryonic stem cells are the most potent since they must become every type of cell in the body. Embryonic stem cells are considered pluripotent instead of totipotent because they do not have the ability to become part of the extra-embryonic membranes or the placenta. Plasticicity is the ability of a stem cell isolated from one tissue to "convert" to cells found in a different tissue, and sometimes even into cell types that originated from a completely different embryonic germ layer.  " Plasticity" have generated a great deal of enthusiasm as adult stem cell plasticity would fulfill the tissue engineer's dream of isolating stem cells from easily accessible sources like teeth, fat for regeneration of many different tissues by reprogramming the genes, a phenomenon called "Transdifferentiation" (e.g.,iPSC ). Adult tissue (adult stem cells). Embryonic stem cells are derived from a four- or five-day-old human embryo that is in the blastocyst phase of development. The blastocyst consists of an inner cell mass (embryoblast) and an outer cell mass (trophoblast). This latter mass is the source of embryonic stem cells - totipotent cells (cells with total potential to develop into any cell in the body). Embryonic stem cells are able to differentiate into more cell types than adult stem cells, over 220 types of cells in the human adult body. Embryonic stem cells can be grown relatively easily in culture than adult stem cells [Figure 1]. Embryonic stem cell research has triggered enormous debate due to the destruction of an embryo following cell extraction. Umbilical cord blood stem cells are stem cells collected from the umbilical cord at birth that can produce all of the blood cells in the body (hematopoietic). Cord blood is currently used to treat patients who have undergone chemotherapy to destroy their bone marrow due to cancer or other blood-related. Adult or somatic stem cells exist throughout the body after embryonic development and are found inside of different types of tissue. These stem cells have been found in tissues such as the brain, bone marrow, blood, blood vessels, skeletal muscles, teeth, heart, gut, skin, liver, ovarian epithelium, and testes. They remain in a quiescent or non-dividing state for years until activated by disease or tissue injury. Unfortunately, adult stem cells are present in miniscule quantities and this can present difficulty for identifying and isolating them in numbers great enough to use therapeutically. Because adult stem cells aren't as 'young' as embryonic stem cells, they contain more DNA abnormalities acquired with age. These can be caused by the environment, toxins or errors in DNA replication. [Table 1] summarizes the differences between embryonic and adult stem cells. The history of research on adult stem cells began about 60 years ago when researchers discovered that the bone marrow contains at least two kinds of stem cells. One population, called hematopoietic stem cells, forms all the types of blood cells in the body. A second population, non-hematopoietic stem cells make up a small proportion of the stromal cell population in the bone marrow, and can generate bone, cartilage, fat, cells that support the formation of blood, and fibrous connective tissue (also called, or skeletal stem cells by some) were discovered a few years later. Owen and Friedenstein  called these cells "bone marrow stromal stem cells" (BMSCs) later Caplan  coined the term "mesenchymal stem cells" and some others , have chosen the term "skeletal stem cells" (SSCs) based on their ability to recreate all cell types associated with skeletal tissue. Investigators have reported that mesenchymal stem cells (SSCs) like other adult stem cells, exhibit plasticity and are able to differentiate into cell types in addition to skeletal cells, such as muscle cells, nerve cells, cardiomyocytes. , Studies have shown that MSCs can differentiate into cells normally associated with the ectoderm and endoderm, such as neurons and muscle cells, respectively  [Figure 2]. There are five recognized dental stem cell populations. Because of their ability to differentiate into bone and other periodontal tissues, dental stem cells have received much attention from both researchers and clinicians. Mesenchymal stem cells have isolated and characterized from dental pulp stem cells (DPSCs), periodontal ligament stem cells (PDLSCs), the remnant pulp of deciduous teeth stem cells from human exfoliated deciduous teeth (SHED), dental follicle stem cells (DFSCs), and stem cells from apical papilla (SCAP). The dental stem cells are usually obtained from deciduous teeth, wisdom teeth, and therapeutically extracted teeth. In vitro, SCAP cells can be stimulated to form mineralized tissue, however, induced SCAP cells also express dentin sialoprotein (DSP): A protein which is involved in dentine synthesis. Similarly, in vivo transplantation of human SCAP into immunocompromised mice resulted in the generation of odontoblasts capable of depositing new dentine. , These results suggest that although SCAP can display certain osteogenic characteristics, they preferentially differentiate into dentine producing cells, reminiscent of odontoblast like cells. In a clinical study, d'Aquino et al.,  investigated the use of autologous DPSCs for the treatment of an alveolar bone defect following wisdom tooth extraction. DPSCs were isolated form patients maxillary molars and expanded ex vivo before seeding into a collagen scaffold. Patients treated with autologous DPSCs showed consistently enhanced regeneration of the bone defect as judged by gain of vertical bone height compared with patients treated with the collagen scaffold alone. A recent clinical case study by Feng et al.,  indicated that autologous human progenitor cells form periodontal ligament may enhance tissue regeneration in patients with periodontitis. Three male patients with periodontitis were treated with autologous periodontal ligament progenitor cells (PDLPs) seeded onto Calcitite R 4060-2 bone grafting material at the periodontal defect site. Patients' assessment at 32 months following PDLP implantation and demonstrated decreased tooth movement and probing depth at the treatment site, in addition to improvement of attachment gain, compared with pre-treatment conditions. It requires the three key elements to combine together to form the basic framework for the formation of engineered tooth tissues [Figure 2]. An extracellular matrix scaffold (which can be synthetic). Developments in dental stem cell research are taking place in such a way that they are beyond our expectation at present. However, it is a long journey, there are certain milestones to be passed and need to surmount obstacles encounter in the way before the use of stem cells in a clinical setting to transform dentistry as we know it, and even revolutionize contemporary dentistry. Along with technical aspects, various other issues like social, political, ethical, and religious viewpoints need to be addressed in the scientific and clinical use of stem cells. Dental precursor cells are attractive for novel approaches to treat diseases like periodontitis, dental caries or to improve dental pulp healing and the regeneration of craniofacial bone and teeth. Further, dental stem cells can be utilized to regenerate different tissues like nerve and bone. Even though most of these modalities are still in infancy, it is evident that the 21 st century dentist is going to play a critical role in the field of medicine. 1. Lakshmipathy U, Verfaillie C. Stem cell plasticity. Blood Rev 2005;19:29-38. 2. Van Os R, Kamminga LM, de Haan G. Stem cell assays: Something old, something new, something borrowed. Stem Cells 2004;22:1181-90. 3. Kuhn NZ, Tuan RS. Regulation of stemness and stem cell niche of mesenchymal stem cells: Implications in tumorigenesis and metastatis. J Cell physiol 2010;222:268-77. 4. Owen M, Friedenstein AJ. Stromal stem cells: marrow-derived osteogenic precursors. Ciba Found Symp 1988;136:42-60. 5. Bianco P, Riminucci M, Gronthos S, Robey PG. Bone marrow stromal stem cells: Nature, biology, and potential applications. Stem Cells 2001;19:180-92. 6. Kuznetsov SA, Krebsbach PH, Satomura K, Kerr J, Riminucci M, Benayahu D, et al. Single-colony derived strains of human marrow stromal fibroblasts form bone after transplantation in vivo. J Bone Miner Res 1997;12:1335-47. 7. Bianco P, Robey PG. Skeletal stem cells. In: Lanza RP, editor. Handbook of adult and fetal stem cells. San Diego: Academic Press; 2004. p. 415-24. 8. Barry FP, Murphy JM. Mesenchymal stem cells: Clinical applications and biological characterization. Int J Biochem Cell Biol 2004;36:568-84. 9. Zipori D. Mesenchymal stem cells: Harnessing cell plasticity to tissue and organ repair. Blood Cells Mol Dis 2004;33:211-5. 10. Huang GT, Gronthos S, Shi S. Mesenchymal stem cells derived from dental tissues vs. those from other sources; their biology and role in regenerative medicine. J Dent Res 2009;88:792-806. 11. Liu L, ling J, Wei X, Wu L, Xiao Y. Stem cell regulatory gene expression in human adult dental pulp and periodontal ligament cells undergoing odontogenic/osteogenic differentiation. J Endod 2009;35:1368-76. 12. Pryzborski SA. Differentiation of human embryonic stem cells after transplantation in immune-deficient mice. Stem Cells 2005;23:1242-50. 13. Shi S, Bartold PM, Miura M, Seo BM, Robey PG, Gronthos S. The efficacy of mesenchymal stem cells to regenerate and repair dental structures. Orthod Craniofac Res 2005;8:191-9. 14. Gronthos S, Mankani M, Brahim J, Robey PG, Shi S. Postnatal human dental pulp stem cells (DPSCs) in vitro and in vivo. Proc Natl Acad Sci USA 2000;97:13625-30. 15. Kraft DC, Bindslev DA, Melsen B, Abdallah BM, Kassem M, Klein-Nulend J. Mechanosensitivity of dental pulp stem cells is related to their osteogenic maturity. Eur J Oral Sci 2010;118:29-38. 16. Seo BM, Miura M, Gronthos S, Bartold PM, Batouli S, Brahim J, et al. Investigation of multipotent postnatal stem cells from human periodontal ligament. Lancet 2004;364:149-55. 17. Miura M, Gronthos S, Zhao M, Lu B, Fisher LW, Robey PG, et al., SHED: Stem cells from human exfoliated deciduous teeth. Proc Natl Acad Sci USA 2003;100:5807-12. 18. Sonoyama W, Liu y, Fang D, Yamaza T, Seo BM, Zhang C, et al. Mesenchymal stem cell-medicated functional tooth regeneration in swine. PloS One 2006;1:1-8. 19. Abe S, Yamaguchi S, Watanabe A, Hamada K, Amagasa T. Hard tissue regeneration capacity of apical pulp derived cells (APDCs) from human tooth with immature apex. Biochem Biophys Res Commun 2008;371:90-3. 21. Vollner F, Ernst W, Driemel O, Morsczeck C. A two-step strategy for neuronal differentiation in vitro of human dental follicle cells. Differentiation 2009;77:433-41. 22. Handa K, Saito M, Yamauchi M, Kiyono T, Sato S, Teranaka T, et al. Gementum matrix formation in viov by cultured dental follicle cells. Bone 2002;31:606-11. 23. Morsczeck C, Gotz W, Schierholz J, Zeilhofer F, Kühn U, Möhl C, et al. Isolation of precursor cells (PCs) from human dental follicle of wisdom teeth. Matrix Biol 2005;24:155-65. 24. Kim SH, Kim KH, Seo BM, Koo KT, Kim TI, Seol YJ, et al. Alveiolar bone regeneration by transplantation of periodontal ligament stem cells and bone marrow stem cells in a canine peri-implant defect model: A pilot study. J Periodontal 2009;80:11815-23. 25. Zheng Y, Liu Y, Zhang CM, Zhang HY, Li WH, Shi S, et al. Stem cells from deciduous tooth repair mandibular defect in swine. J Dent Res 2009;88:249-54. 26. d'Aquino R, De Rosa A, Lanza V, Tirino V, Laino L, Graziano A, et al. Human mandible bone defect repair by the grafting of dental pulp stem/progenitor cells and collagen sponge biocomplexes. Eur Cell Mater 2009;18:75-83. 27. Feng F, Akiyama K, Liu Y, Yamaza T, Wang TM, Chen JH, et al. Utility of PDL progenitors for in vivo tissue regeneration: A report of 3 cases. Oral Dis 2010;16:20-8. 28. Nakashima M, Iohara K, Sugiyama M. Human dental pulp stem cells with highly angiogenic and neurogenic potential for possible use in pulp regeneration. Cytokine Growth Factor Rev 2009:20:435-40. 29. Nakashima M, Akamine A. The application of tissue engineering to regeneration of pulp and dentin in endodontics. J Endod 2005;31:711-8. 30. Reddi AH. Role of morphogenetic proteins in skeletal tissue engineering and regeneration. Nat Biotechnol 1998;16:247-52. 31. Nakashima M, Reddi AH. The application of bone morphogenetic proteins to dental tissue engineering. Nat Biotechnol 2003;21:1025-32. 32. Murray PE, Garcia-Godoy F, Hargreaves KM. Regenerative endodontics: A review of current status and a call for action. J Endod 2007;33:377-90. 33. Nakashima M, Akamine A. The application of tissue engineering to regeneration of pulp and dentin in endodontics. J Endod 2005;31:711-8. 34. Honda MJ, Fong H, Iwatsuki S, Sumita Y, Sarikaya M. Tooth-forming potential in embryonic and postnatal tooth bud cells. Med Mol Morphol 2008;41:183-92. 35. De Kok IJ, Peter SJ, Archambault M, van den Bos C, Kadiyala S, Aukhil I, et al. Investigation of allogeneic mesenchymal stem cell-based alveolar bone formation: Preliminary findings. Clin Oral Implants Res 2003;14:481-9. 36. Mankani MH, Krebsbach PH, Satomura K, Kuznetsov SA, Hoyt R, Robey PG. Pedicled bone flap formation using transplanted bone marrow stromal cells. Arch Surg 2001;136:263-70. 37. Murray PE, Garcia-Godoy F. Stem cell responses in tooth regeneration. 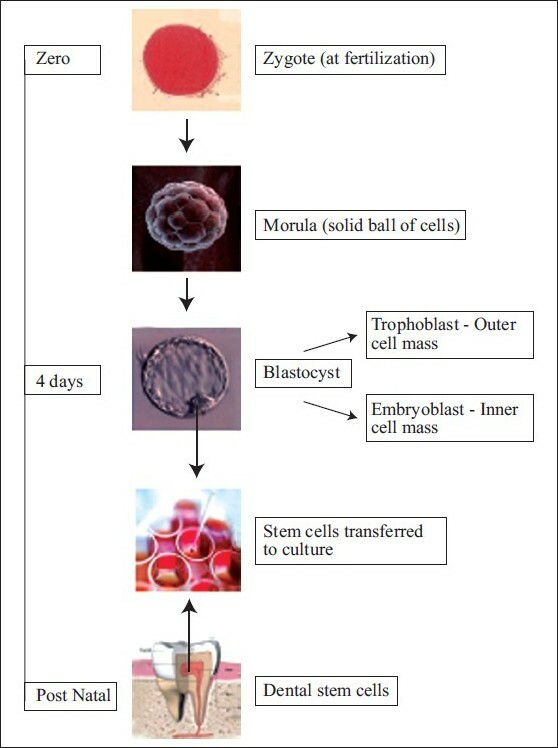 Stem Cells Dev 2004;13:255-62. 38. Morsczeck C, Reichert TE, Völlner F, Gerlach T, Driemel O. The state of the art in human dental stem cell research. Mund Kiefer Gesichtschir 2007;11:259-66. 39. Mao JJ, Giannobile WV, Helms JA, Hollister SJ, Krebsbach PH, Longaker MT, et al. Craniofacial tissue engineering by stem cells. J Dent Res 2006;85:966-79. 40. Ulmer FL, Winkel A, Kohorst P, Stiesch M. Stem cells - prospects in dentistry. Schweiz Monatsschr Zahnmed 2010;120:860-72. 41. Arthur A, Rychkov G, Shi S, Koblar SA, Gronthos S. Adult Human Dental Pulp Stem Cells Differentiate Toward Functionally Active Neurons Under Appropriate Environmental Cues. Stem Cells 2008;26:1787-95. 42. Krasner P, Verlander P. Stem cells in dentistry and medicine: The dentist's role. Dent Today 2011;30:128, 130-4.